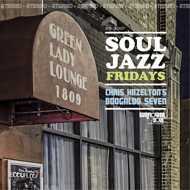 For over two years, organist Chris Hazelton and his soulful septet, the Boogaloo 7, have held down a wildly successful residency every Friday night at Kansas City’s acclaimmed Green Lady Lounge. Expanding on the funky sounds popularized by Jimmy McGriff, Charles Earland, Lou Donaldson, and others, this group brings a mixture of original tunes and covers, both old and new, that excite and move audiences week after week. With two in-demand 45rpm singles already under their belt, the logical next step was a full length album, and this one catches them in their element: live at the club they call home.